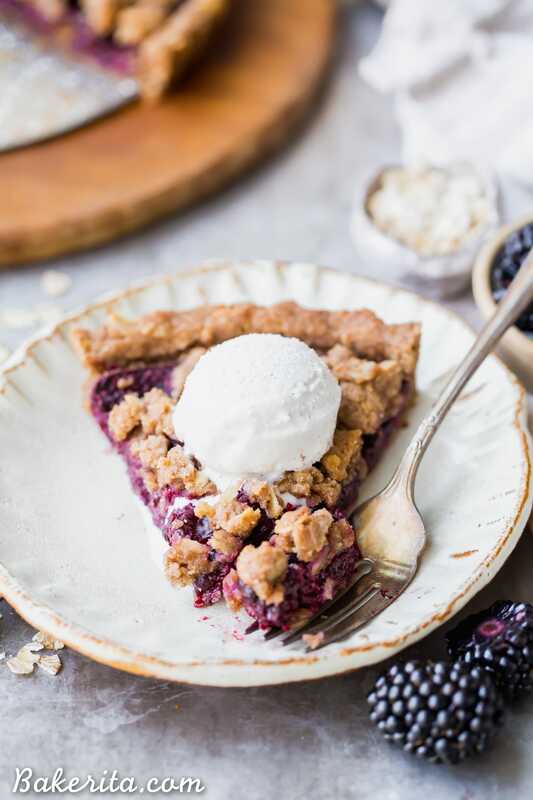 This quick and easy Blackberry Crisp Tart has an oatmeal crust, a layer of quick blackberry chia jam, and fresh blackberries! It’s perfect with vanilla ice cream. This simple recipe is gluten-free, refined sugar-free and vegan. **August 2018 Update! 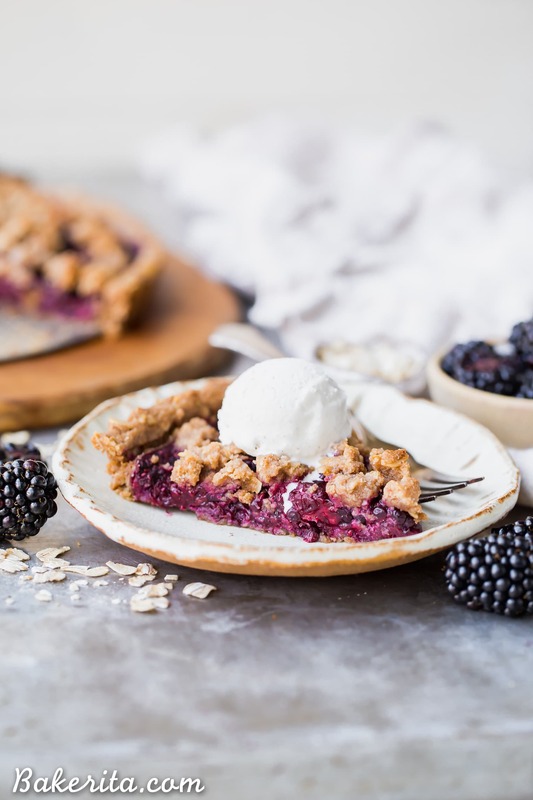 ** This Blackberry Crisp Tart is absolutely delicious and has gotten some major love over the two years since it was originally posted on March 9th, 2016…but I thought it deserved a little makeover with a bit of a recipe update and new photos that show off how gorgeous it is! I added a super quick layer of blackberry chia jam to the recipe that makes such a delicious different and amps up the fresh blackberry flavor even more than before. Since I started working for myself, I’ve started spending a lot of time in coffee shops. Despite that I stopped drinking coffee for the most part late last year, I’ve spent a good portion of each week this past year mooching off of free WiFi and becoming a regular at a few favorite coffee shops on my street. When I’ve been with myself a little too long, I pull myself out of my flour-covered pajamas and head to the small coffee shop a block down from my apartment, or the Starbucks a half a mile down the road. Let’s be honest, my choice usually depends on how hard it’s raining – the harder the showers are pouring down, the more likely I’m taking the shorter walk. Armed with my green tea or coconut milk matcha latte, I can find new inspiration. By far, my most productive hours are while sitting in the company of the fellow self-employed, all of us hunched over our laptops in a weird sort of solitary unity. Some days, I’ll spend hours sitting there with my podcast queue streaming, and when I’m done photo editing, writing, and scheduling, it’s dark and the baristas have all changed shift. In fact, I’m on one of those stretches as I write this. My green tea latte is almost gone, and I couldn’t tell you how long I’ve been sitting here, just how many items I’ve checked off my to-do list. The final check for the day? 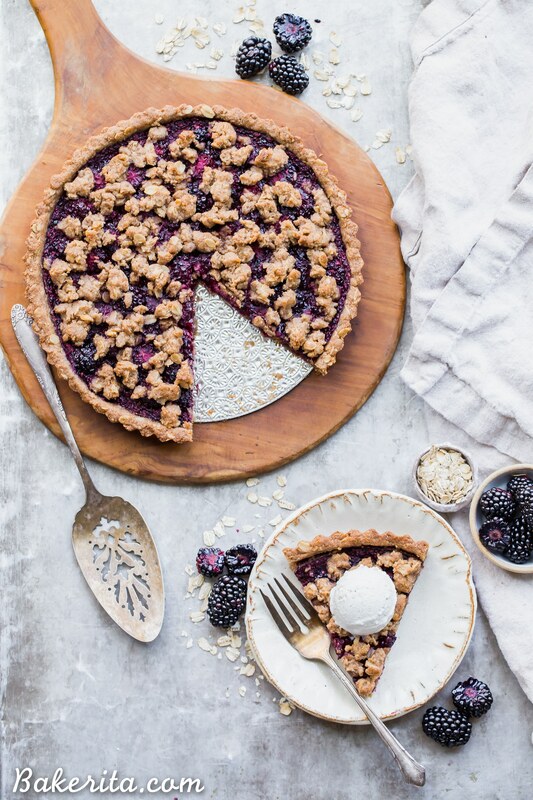 To tell you guys about this delicious Blackberry Crisp Tart! Doesn’t it look delicious? Maybe I’m partial – I love blackberries. They’re one of my favorite fruits to eat and bake with because I can’t get enough of their bright flavor and tartness! When they’re baked, they soften up and sweeten a bit, especially when they’re tossed with a hint of maple syrup and vanilla extract. The crust doubles as the crust and the crispy crumble topping – who wants to have to make two different doughs? Definitely not me. Because the dough does double duty, this tart can be in the oven in about fifteen minutes or less. This tart is made with almond flour and rolled oats – be sure to use gluten-free certified oats to ensure you keep the recipe totally gluten-free if necessary! It’s also refined sugar-free, as both the filling and the crust are sweetened with maple syrup, and it’s totally vegan. If you need a dessert to serve to a group of friends with a bunch of dietary restrictions, this one definitely checks all the boxes. 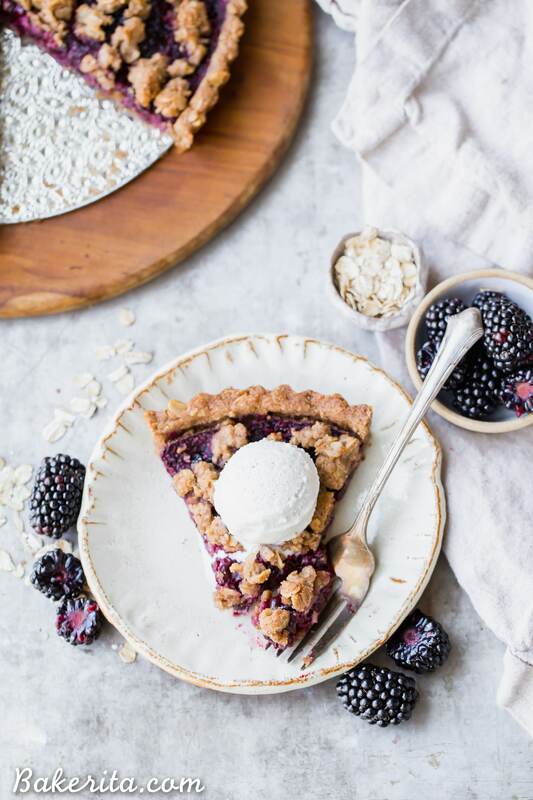 This quick and easy Blackberry Crisp Tart has an oatmeal crust, a layer of quick blackberry chia jam, and fresh blackberries! It's perfect with vanilla ice cream. This simple recipe is gluten-free, refined sugar-free and vegan. Preheat the oven to 350ºF. Lightly grease an 8- or 9-inch tart pan with a removable bottom. Blend 1 cup of blackberries with chia seeds in a blender until the blackberries are all blended and set aside to let it set up for 10 minutes. Halves the remaining blackberries and toss with the maple syrup and tapioca starch in a medium bowl. Set the blackberries aside while you make the crust. Add the almond flour, oats, maple syrup, baking powder, and salt to a different bowl and whisk until combined. Add the coconut oil and use your fingers to work it in until coarse crumbs form and the mixture holds together when pressed. Remove a heaping ½ cup of the crumbs for the topping and pour the remaining crumbs into the bottom of the prepared pan. Press the dough evenly down into the pan. Bake for 8-10 minutes or until a little puffy and beginning to set. Remove from oven and spread the blackberry chia mixture over the top of the baked crust. Arrange the halved blackberries on top of that and sprinkle the remaining crumble evenly over the top of the berries. Bake for 40-45 minutes or until the filling is bubbling and the crust is lightly brown. At around 20 minutes, tent the tart with foil to prevent it from getting too brown. Let cool completely before slicing and serving. Honey can be substituted for the maple syrup if you're not vegan. I rest my case that EVERYONE is more productive when they bring their work to a coffee shop! Maybe it’s just the glorious abundance of coffee? LOL. Sometimes I just have to get out of my house too and coffee shops are definitely a great place to feel more productive! This crisp looks absolutely delicious, love that it’s vegan and gluten free! So perfect for everyone to enjoy. I love working in coffee shops, too! I feel like I get so much more done, because then I’m not distracted by everything else at my house! This tart look so gorgeous, Rachel! It’s making me excited for all of the fresh fruit that will soon be in season! I just CANNOT stay home all the time and work. I just can’t. Sometimes all I need to be jolted back to productivity is a change of scenery! 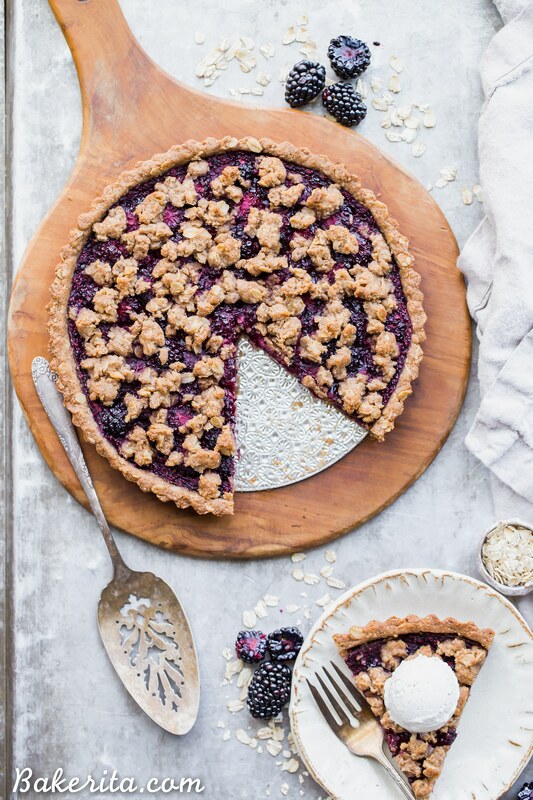 This tart is seriously amazing, I share your love of blackberries so I have got to make this ASAP! You know, I’ve never worked in a coffee shop but you’ve made the case for it being a nice change of scenery! Plus – the aroma of fresh coffee all day? I say yes! And I say yes to this gorgeous tart! I love blackberries! Rachel this is one GORGEOUS tart and I am so excited for all the fresh fruits now!! I have to make this super soon!! I am so excited for fresh berries to start arriving at my local market. Can’t wait to try this gluten free crust. I have a hard time with those! This looks amazing – can’t wait to try it out! If I don’t have a tart tin, is it possible to make this in a pie tin instead? Just wondering if I need to make a special purchase to get one..
Hi Natalie! You definitely don’t need to make a special purchase. I would actually recommend making them into bars instead of a pie pan – just press the crust into a 8″ or 9″ square baking pan. I’d recommend lining the pan with parchment or foil to pull them out easily. :) Enjoy! Haha oh I’m always at the coffee shop in my yoga pants ;) thanks, Ashley! I used to love working in coffee shops before we had the kiddos too, now I just take the kids along to my moms house if she’s home just so I can get out of the house and she helps to babysit haha :) This tart looks amazing, Rachel! Love all those gorgeous blackberries! I’ve never worked on blog stuff anywhere but at home and I should — there are so many distractions here! And I’m with you — I love blackberries and don’t think most people think to bake with them very much. This tart looks so delicious and I love that crisp topping! Thanks so much, Marcie! I would go so stir crazy if I always worked at home – I swear I get more done in an hour or two at a coffee shop than I do all day at home, haha. This tart is stunning and I love that it’s vegan and gluten free! I also love that it has the crisp part (the topping) and the tart part (the base)! Usually desserts only have one or the other, but I say MORE carbs always :) Pinning! Outstanding! 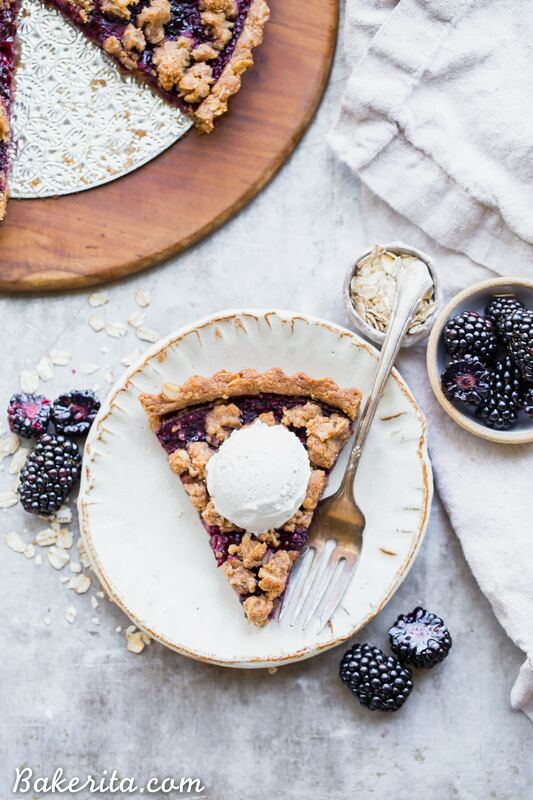 I think blackberries are under rated in the berry world but this tart brings them up front. This is a beautiful crisp/tart. Take care. This tart is gorgeous, Rachel! I really love that second photo where you can see all the colors. So pretty! And I wish I worked for myself – I would totally spend all my time in coffee shops too!! Hii! Could I replace the tapioca starch with cornstarch? Hi Sara. Definitely! I would use 1 teaspoon instead of 2 in that case. Enjoy! Is the almond flour actually defatted almond FLOUR or just finely ground almond? I used blanched almond flour, which has the skins removed but is just finely ground flour. Could this recipe be done with raspberries? Would I need to make any changes? That will be delicious – no changes necessary, just switch out the raspberries for the blackberries. Enjoy! Hi. Could I sub. the almond flour with coconut flour?Thanks! Hi Paige – I wouldn’t recommend it. Coconut flour is much more absorbent than other flours and it doesn’t substitute well in most cases. I’d recommend using coconut flour only in recipes that specifically call for it. Hope this helps! Big, beautiful blackberries came in my CSA box this week, so I found this recipe on Pinterest. I made it using the fresh blackberries today. The recipe was easy to follow and it tastes heavenly!!!! I’m so glad you enjoyed the tart, Laurel! Is it essential the coconut oil is solid? The coconut oil I have on hand is liquid at room temperature. Could a vegan margarine be used as a substitute (assuming the solid aspect of the fat is what is required)? Hi Allie! The crust just might get a little oily if you use it melted – I’d suggest putting it into the fridge for about 10 minutes and it should firm up enough to use here. Enjoy! Thanks! I used your suggestion and a previous one for how to modify to make in a glass baking dish, and it turned out great! If I was to use frozen blackberries what changes would be suggested?